Little Pitchers: Conversations with FOUR year-olds! Now that the boys are four years old, they are quick to assure me that "Four year olds can do whatever they want," and "Four year olds aren't afraid of watching Star Wars," and "Four year olds are even smarter than everyone." Although it's annoying, it's actually proving to be awesome for me, because I am not so bad coming up with those myself. "Four year olds never whine," "Four year olds always finish their dinner," and "Four year olds don't need any help getting ready." And even though I'm not as smart as your average four year old, my kids occasionally listen and obey. 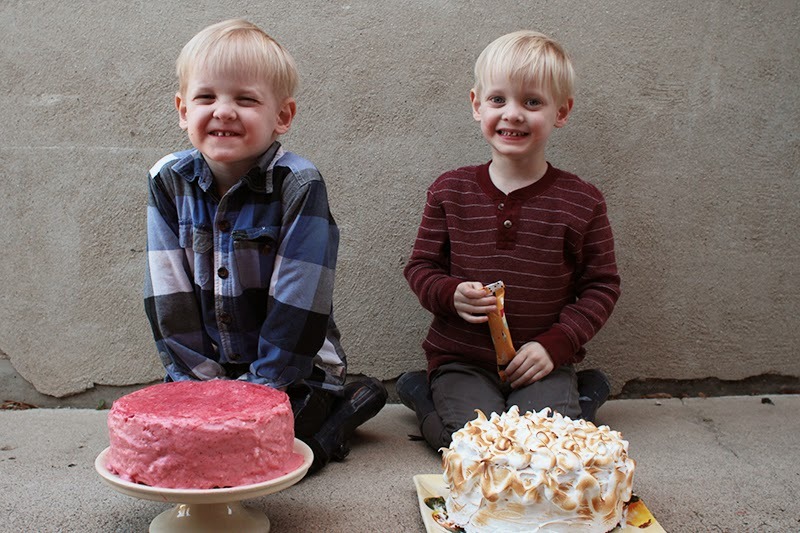 This is a picture of the boys with their requested birthday cakes. Long ago, I decided that I would never throw the boys individual birthday parties, but at least I could let them each request their own cake. Months ago, Grey announced that he wanted a strawberry cake and has adamantly held to that. For a few weeks, Micah wanted a chocolate cake- and then, flipping through my Smitten Kitchen cookbook, he saw a picture of that cake. Me: That's a s'mores cake. Micah: Please, please, please make me that cake for my birthday. Me: I thought you wanted a chocolate cake. Micah: That is because I didn't know about s'mores cakes. But now I do. So I really, really want it. Grey (snatching up a valentine): My love! My love! Travis: You mean, your heart? Grey: No. This is called "my love." Me: Did your love give it to you? Grey: Just my friend Elanor did. Me: and is she your love? Grey: Hmm. I like her, though. Micah: Maybe you could read me a poem. Or two poems! Or three poems! Micah: Ah, no. Four poems is too many. Micah: Whoa, are we in outer space? Travis: No, but we can pretend that we are. Grey: Hey dad. I have a secret for you. The whole world is in outer space. So actually, yes. We are. Micah: Stop Grey. It's true. Micah: Sure, it's funny. But it's also true, so don't laugh anymore. Grey: I have a question mark for you. Grey: What is for lunch, question mark? Grey: My dear mother, can we go to Grandma Pitcher's this evening? Grey: But I want to go there so FREAKING bad! Me: Grey! You are not allowed to touch my sewing machine. It's not a toy, it's a tool and you screwed up all my settings. Grey: Well, I promise not to do it again, if you think you can forgive me this time. Micah (yelling): What is happening?! Grey: Calm down. I will watch and find out. Soon we will know what's happening. Micah: Don't worry... Batman... the evil Dark Knight... is protecting... Gotham City. Micah: I'm just texting commissioner Gordon. Micah: Darth Vadar is really mean and I do NOT want to go to his home. But if I did, I would bring my special sword. Micah: (scoffs) Ha! No! I would bring a real sword that was hard and sharp. Then I could actually fight him. Micah: I am Luke and Grey is Han Solo and you are the Princess and Baby August is Chewie. Stop folding laundry RIGHT NOW. Princess Leia never folds laundry, and stop singing. She never sings baby songs to Chewie. Now, wait here in your room and we will come and rescue you. Oh my gosh, I want to eat your cakes!!! Haha. I need to make some for myself. You've inspired me. Your kids are hilarious and know all about star wars! The whole world is in outer space. Amazing.